Wholesale sales rose 1.2% to a record $63.7 billion in May. Sales were up in four of seven subsectors, representing approximately 50% of total wholesale sales. The miscellaneous, building material and supplies, and farm product subsectors contributed the most to the gains in May, while the motor vehicle and parts subsector posted the largest decline. In volume terms, wholesale sales increased 1.3%. In dollar terms, the miscellaneous subsector reported the largest increase in May, as sales rose 7.8% to $8.3 billion. Sales were up in four of five industries, led by the agricultural supplies industry (+25.6%) following a 5.4% decline in April. In volume terms, the agricultural supplies industry increased 27.4%. Sales in the building material and supplies subsector rose 5.0% to $9.7 billion as all industries posted gains in May. Much of May's increase was attributable to higher sales in the lumber, millwork, hardware and other building supplies industry, up 7.3% to $4.9 billion. This was the third consecutive increase for the industry and the highest sales level since July 2017. In volume terms, the industry increased 6.8%, indicating that the gain in the current dollar series was partly price driven. In May, international merchandise trade reported gains in both imports and exports of building and packaging materials. Following a 17.5% decline in April, the farm product subsector rebounded in May, up 25.5% to $859 million. This was the third increase in four months and the highest level since November 2017. A 28.5% increase in volume terms signifies that price changes had no impact on the growth seen in the current dollar series. Exports of farm and fishing products increased in May. The motor vehicle and supplies subsector recorded the largest decline in dollar terms in May, down 2.5% to $11.1 billion. This was the second consecutive monthly decline and the fifth drop in six months, bringing the subsector to its lowest level since December 2016. The sole contributor to the decrease was the motor vehicle industry, down 3.7% to $8.9 billion. Imports and exports of passenger cars and light trucks as well as manufacturing sales of motor vehicles declined in May. Sales were up in eight provinces in May, accounting for 49% of total wholesale sales in Canada. Higher sales in the western provinces led the gains. In dollar terms, Alberta contributed the most to the increase, more than offsetting the decline reported in Ontario. 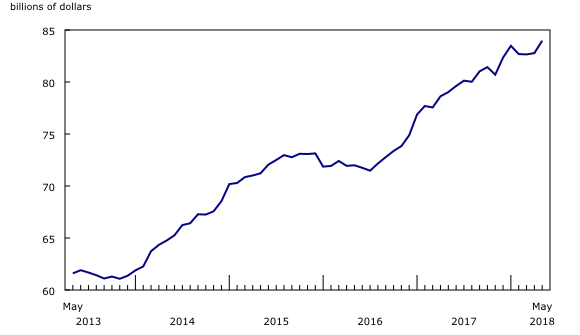 Alberta reported its fifth increase in six months, with sales rising 6.7% to $7.3 billion, their highest level on record. Sales were up in six subsectors, led by the miscellaneous subsector (+26.7%). The agricultural supplies industry within the miscellaneous subsector contributed the most to the gains. Sales in Saskatchewan increased for the third consecutive month, up 9.8% to $2.3 billion—the highest level since December 2016. The miscellaneous subsector (+17.2%) led the gains, with the agricultural supplies industry contributing the most to the increase. In British Columbia, sales grew 1.9% to $6.7 billion, its third consecutive gain. The gains were led by the machinery, equipment and supplies subsector (+11.4%), more than offsetting the 10.2% decline in April. Sales in Nova Scotia rose 9.0% to $962.3 million, driven by gains in the food, beverage and tobacco subsector (+38.8%). Ontario posted its second consecutive monthly decline in May, down 0.9% to $32.1 billion. The motor vehicle and parts (-4.6%) and the food, beverage and tobacco (-6.5%) subsectors led the decrease. The motor vehicle and parts subsector was down for the second consecutive month, while the food, beverage and tobacco subsector declined for the second time in four months. Wholesale inventories rose for the second consecutive month, up 1.4% to a record $84.0 billion in May. Five of seven subsectors posted increases, representing 90% of total wholesale inventories. In dollar terms, the machinery, equipment and supplies subsector (+1.6%) posted the largest gain, following a 0.3% decline in April. Three of four industries increased, with the other machinery, equipment and supplies industry contributing the most to the upturn. Inventories grew 2.7% in the miscellaneous subsector, a third consecutive monthly gain. Increases were reported by all five industries and were led by increased stock in the other miscellaneous industry (+4.0%). The building material and supplies subsector (+2.0%) rose for the third consecutive month, on the strength of higher inventories in the metal service centres (+3.8%) and the lumber, millwork, hardware and other building supplies (+1.6%) industries. Higher inventories in the motor vehicle and parts subsector (+2.0%) were led by increased stock in the motor vehicle industry (+2.9%). The inventory-to-sales ratio increased from 1.31 in April to 1.32 in May. This ratio is a measure of the time in months required to exhaust inventories if sales were to remain at their current level. 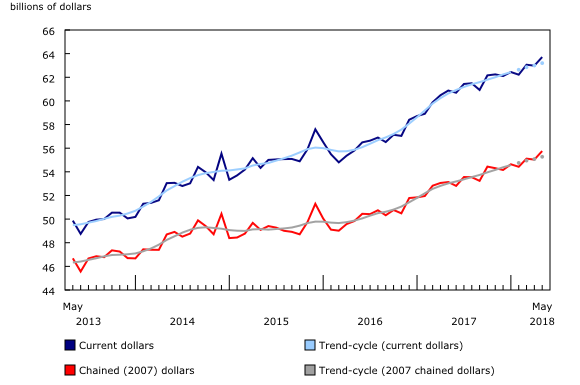 Starting this month, the Monthly Wholesale Trade Survey (MWTS) produces constant dollar data for wholesale sales at the industry level (North American Industry Classification System (NAICS)). Publishing constant dollar data by industry allows MWTS to analyse industry trends in greater detail. This monthly data series goes back to January 2009. Table 20-10-0003-01 replaces archived table 20-10-0018-01. Real-time data tables 20-10-0019-01, 20-10-0020-01 and 20-10-0005-01 will be updated on August 13. Wholesale trade data for June will be released on August 21. For analytical information, or to enquire about the concepts, methods or data quality of this release, contact John Burton (613-862-4878; john.burton@canada.ca), Manufacturing and Wholesale Trade Division.